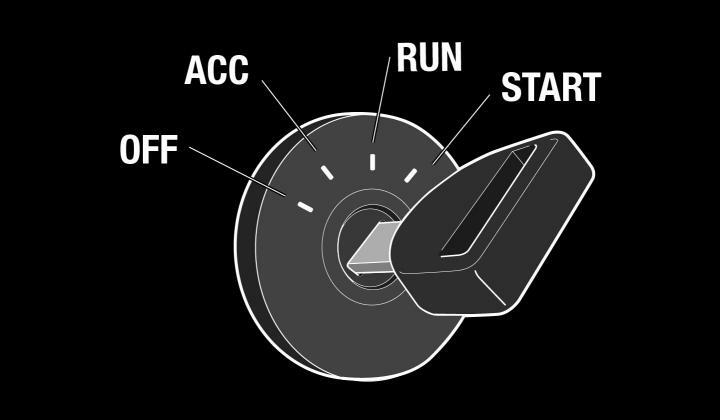 Most vehicle ignition switches have four positions: (1) Lock/Off, (2) Acc/Accessory, (3) On/Run, and (4) Start. When the car has been switched “OFF” the ignition switch cuts power to the engine but connection from the car battery is not cut. 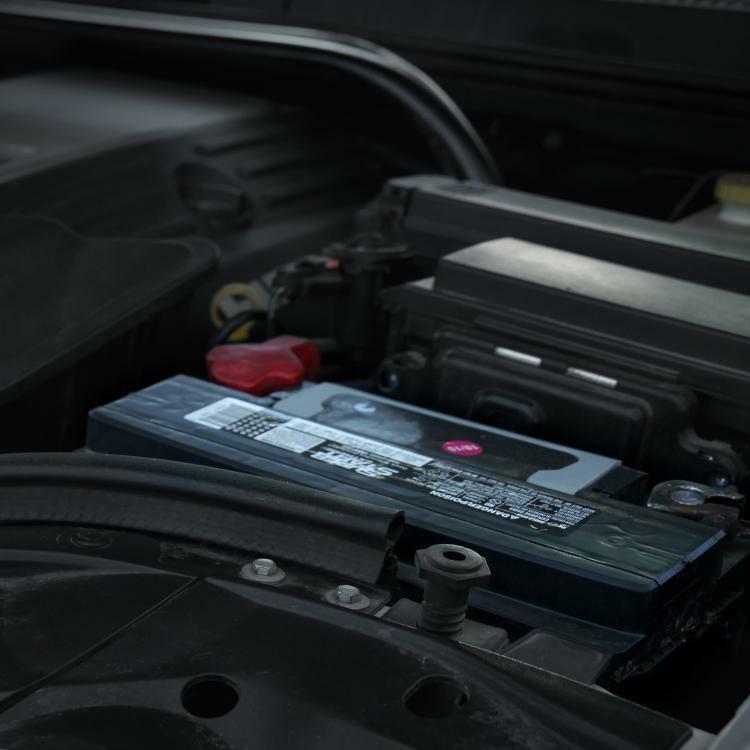 So what happens to the car battery after the vehicle has been turned off? 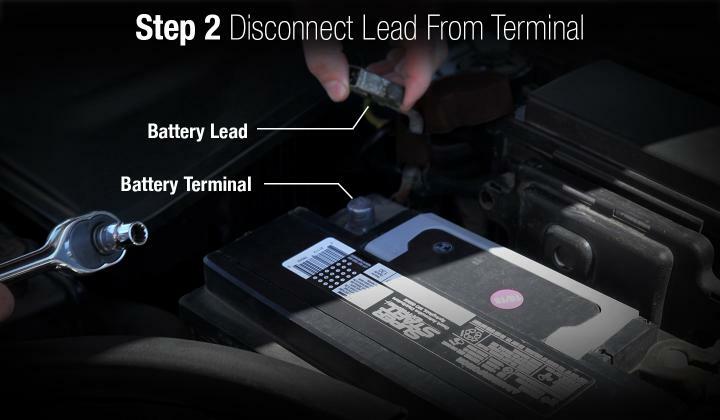 Current continues to be drawn from the car battery while the vehicle is off and is used to power electronics and car accessories such as: the internal clock, engine computer, radio, alarm, lights, mirrors, electronic seats, 12V outlets, etc. This drain of power is called parasitic draw and it is normal for a small amount of current to be drawn from the car battery while the vehicle is off. A normal amount of parasitic draw for newer cars is between 50-milliamp to 85-milliamp current draw. A normal amount of parasitic draw for older cars is a reading less than 50-milliamp. Anything past these amounts indicates an electrical issue and should be addressed by a mechanic. Even though 85-milliamp draw may be normal for newer cars, this amount can still adversely impact the life and performance of a car battery if the car battery is not properly maintained. Therefore, it is important to maintain and charge the battery so that the charge does not drop below 12.4 Volts. Once the voltage drops below 12.4 Volts sulfation kicks in and leads to battery corrosion. To help prevent sulfation, it is beneficial to periodically charge the car battery with a car battery charger. First, you will need to determine the parasitic draw of your vehicle. 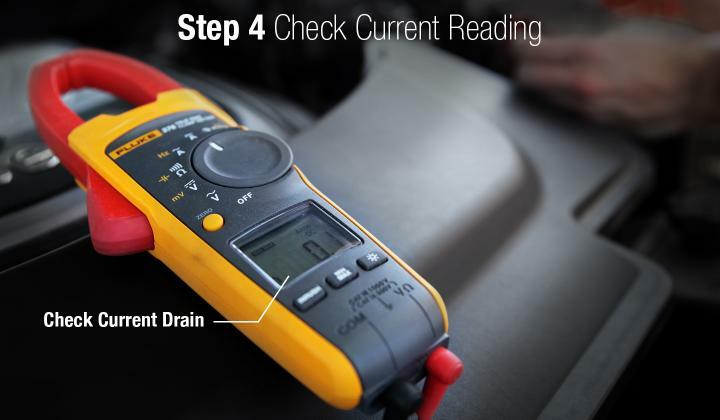 You can do this by performing a parasitic draw test using a multimeter and testing for current (DC Amps). 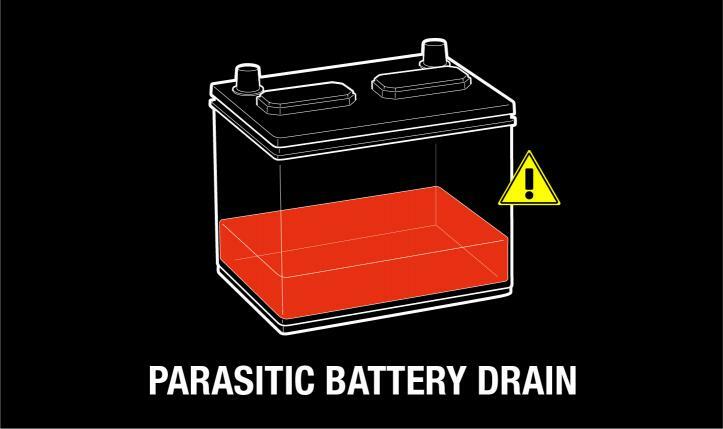 To perform a parasitic draw test, you will be working directly with the car battery so it is important to follow proper safety practices to avoid harm. It is best to remove any jewelry and to wear insulated gloves and protective glasses to avoid shock or exposure to the battery. Never lean directly over the car battery, avoid flames and ignition sources, and make sure you are working in a well ventilated area. Consult the vehicle’s owner manual for specific instructions and safety precautions. 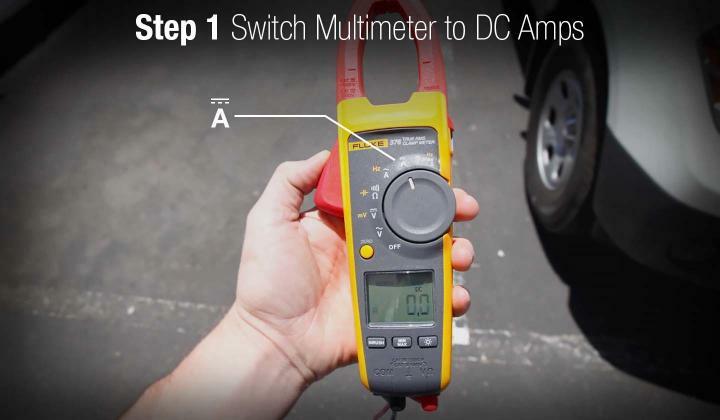 To perform a parasitic draw test, switch the multimeter to the DC Amps mode and set it to the highest Amp level. It is better to start on a high amp level and continue to work your way down through the levels as to not damage the multimeter. Note: be careful when handling your multimeter in the Amps setting as it is a very low resistance; do not connect it directly across the car battery and do not start the vehicle while you are testing. Turn off the car and disconnect the negative (-) car battery lead from the negative (-) car battery terminal; this is the black cable. When the car battery cable has been disconnected, do not let it touch anything that is grounded. Make sure all car accessories and lights have powered off, remove the key from the ignition, and remove any devices plugged into the cigarette lighter socket. You may need to wait up to 30 minutes for the vehicle’s computer modules to power off. 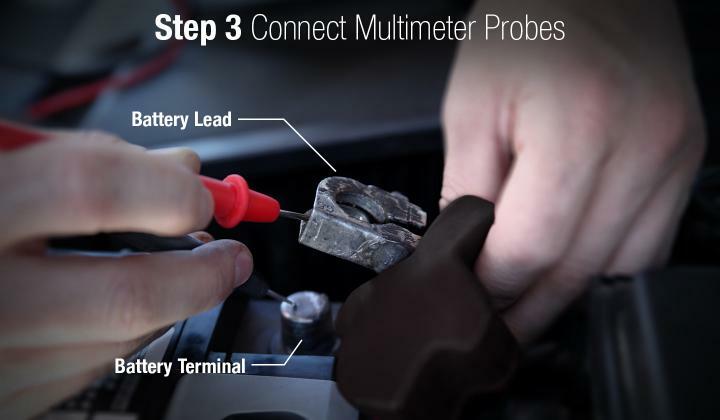 Once the vehicle is powered off, connect the multimeter probes in parallel to the car battery terminal and the car battery lead. This will display the parasitic drain in Amps; if the multimeter is not showing a reading then the setting on the multimeter is too high. Keep switching to a lower level until you obtain an accurate amp reading. Use the chart below to determine if the current draw is acceptable or if it is too high. If the parasitic battery draw is too high, then something is drawing too much power from the car battery while the vehicle is off. High parasitic draw is a problem because the car battery continues to drain without the alternator recharging it; this can cause the battery to go flat, leaving you with a car that won’t start. To avoid the chance of a flat battery, it is important to fix any electrical issues that are causing high parasitic drain. It is common for car accessories such as dimming lights, after market car alarms, after market stereos, proximity keys, bad wiring, etc. to draw large amounts of power while the car is off. It is possible to find the main culprit by removing fuses one at a time to see which circuit is causing the high drain. A knowledgeable mechanic will be able to properly diagnose and repair the issue. Second, it is important to properly maintain the car battery to avoid it going flat. Car batteries can run flat for several reasons: the car has not been driven for long periods of time, the car has been left in freezing temperatures, the lights have been left on, the car has high parasitic draw, and so on. Once a battery has gone flat the car cannot start without the battery being recharged or jumped. Furthermore, a flat car battery cannot be fully recharged from the alternator “surface charging” (going for a drive or idling the engine to recharge the battery), in fact, surface charging will lower the capacity of the battery over time. The only way to reliably recharge a flat battery is to use a car battery charger; a maintenance charger can be left connected to a car battery for an indefinite time if the car is not going to be driven for several weeks. This will ensure the charge of the battery is maintained while you are away. In conclusion, proper battery maintenance will help you to get the most out of your car and your battery.